A trio of trouble. 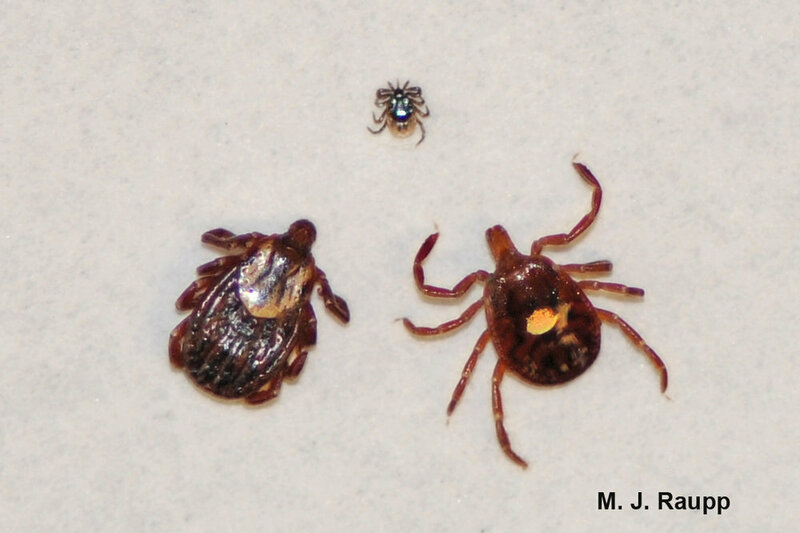 Clockwise from the top: Blacklegged Tick (vector of Lyme and other diseases), Lone Star Tick (vector of alpha-gal and other diseases), American Dog Tick (vector of Rocky Mountain spotted fever and others). Ticks will climb up vegetation and reach out with forelegs to encounter a host. This behavior is called questing. With the return of temperatures in the 70s and 80s in the Washington DC-Metropolitan region, ticks have awakened from their chilly spring torpor to quest for the blood of vertebrate hosts. Last week I bumped into one of my colleagues who shared his tale of removing a lone star tick from his leg. He also related a tale of an unfortunate youngster who now suffers from the syndrome known as alpha-gal, a food allergy to red meat. A few of my outdoor adventure-loving buddies also must eschew tasty beef burgers as a result of alpha-gal, a disease transmitted through the bite of a tick. Let’s dive in and see what this strange sounding syndrome is all about. Alpha-gal syndrome is a human’s immune response to galactose-alpha-1,3-galactose (alpha-gal). Alpha-gal is a carbohydrate (sugar) molecule found on the surface of muscle cells of many types of wild mammals, including mice and rabbits, but also on mammals we eat, including cattle and pigs. When a lone star tick dines on blood of one of these feral or domesticated animals, it ingests the alpha-gal sugar. When the tick feeds again, maybe on you, it injects saliva laden with alpha-gal. Your body’s powerful immune system recognizes this foreign compound and mounts a potent immune response to it. The immune system produces a library of cells ready to produce antibodies to attack alpha-gal the next time it enters your body. Unfortunately, this may happen when you bite into a juicy burger or pulled-pork sandwich. This second exposure can trigger an allergic reaction that can include hives, itching, swelling of the lips, face, tongue and throat, wheezing, shortness of breath, runny nose, sneezing, headache, abdominal pain, diarrhea, nausea or vomiting. In severe cases, a person may suffer anaphylaxis, a potentially fatal allergic reaction. Often the reaction does not occur until several hours after the meal. Range of the Lone Star tick in the United States. Alpha-gal syndrome is found in many parts of the world including Europe, Asia, and Australia but it’s particularly common in the southeastern United States, including our region and parts of New York, New Jersey and New England where lone star ticks are found. Unfortunately, many scientists believe that several species of ticks, including lone star tick, are expanding their ranges due to climate change. Contracting alpha-gal does not relegate one to a meatless existence. Fish, shellfish, poultry, and other non-mammalian meat sources lack the alpha-gal sugar and may be consumed without fear. In addition to alpha-gal, lone star ticks transmit several illnesses, including Southern Tick Associated Rash Illness (STARI) which has been associated with a bacterium, Borrelia lonestari. Symptoms of STARI include a rash, fever, fatigue, and pain in muscles and joints. A second disease spread by the lone star tick is ehrlichiosis. Ehrlichia bacteria produces nasty flu-like symptoms including headache, joint ache, fever, fatigue, muscle ache, confusion, and several other disheartening symptoms. Small immature stages of ticks called nymphs will molt and become adults after taking a blood meal. Both stages can transmit diseases to humans. The adult lone star tick running on my arm is so named for the white spot on its back. To reduce the risks of becoming a meal for a tick and the unfortunate recipient of alpha-gal, STARI, ehrlichiosis, or other tick borne illnesses, including Lyme disease carried by black-legged ticks, remember the word “AIR”. This stands for avoid, inspect, and remove. “A” - Avoid ticks and their bites in the following ways. When taking Fido for a walk, stick to the path, trail, or pavement. You are unlikely to encounter ticks on non-grassy surfaces. If you enter habitats where wildlife and ticks are suspected, such as grassy meadows, boarders of fields and woodlands, and vegetation along the banks of streams, wear long pants and light colored clothing. This will help you spot ticks on your clothes as they move up your body. Be a geek. Tuck your pant legs into your socks. This forces ticks to move up and over your cloths rather than under them where tasty skin awaits. Apply repellents labeled for use in repelling ticks. Some are applied directly to skin, but others can be applied only to clothing. Don’t forget to treat your footwear, socks, and pant legs. Immature ticks called nymphs are a key vector of diseases and these precautions will help prevent nymphs and adults from attaching to your skin. If repellents are used, be sure to read the label, follow directions carefully, and heed precautions, particularly those related to children. If your adventures take you into tick territory, consider placing your cloths directly in a clothes dryer rather than a hamper upon returning home. The heat of the dryer will kill hitchhiking ticks that might otherwise escape clothes in the hamper and cause trouble after your return home. “I” - Inspect yourself, your family, and your pets thoroughly if you have been in tick habitats. Remember to do this when you return from the outdoors and when taking a shower. A thorough inspection may involve enlisting a helper to view those "hard to see" areas around back. “R” - Remove ticks promptly if you find them. Removal within the first 24 hours can greatly decrease your risk of contracting a disease. If you find a tick attached, firmly grasp the tick as close to your skin as possible using a pair of fine forceps and slowly, steadily pull the tick out. Cleanse the area with antiseptic. The CDC and the Bug-Guy do not recommend methods of tick removal such as smearing the tick with petroleum jelly or scorching its rear end with a match. Cases of some tick borne diseases such as Lyme disease are the most common in children and seniors so take special care to keep kids of all ages safe when they play outdoors. Fully engorged ticks are enormous. If you discover a tick that has embedded in your skin and you wish to determine its identity and discover what disease organisms it might harbor, there are several tick testing services that will identify the tick and perform molecular analysis to determine several important disease agents it may be carrying. After a recent encounter with a lone star tick, I sent it off to a tick-testing laboratory. Within a week, I had results and this little rascal tested negative for the causal agents of Lyme disease, relapsing fever, anaplasmosis, Rocky Mountain spotted fever, Pacific Coast tick fever, tularemia, and ehrlichiosis. Lucky me! 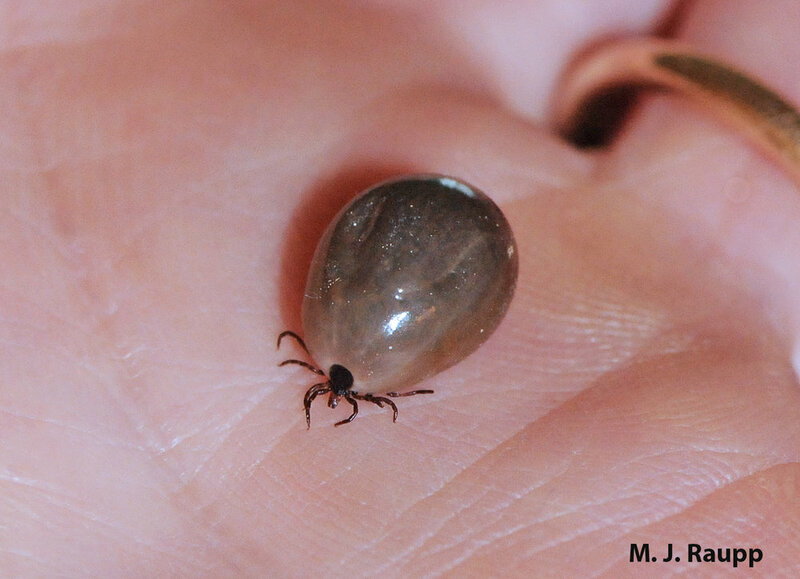 If you find an embedded and engorged tick, consider sending it to a tick-testing lab. If it tests positive for one or more tick borne diseases, consult your physician and develop an action plan. Several tick testing services can be found on the internet by simply googling “Tick Testing Services.” They provide step by step directions to prepare your sample for analysis and where to send it. The Fritz Entomology Lab at the University of Maryland is partnering with the Maryland Department of Health to identify populations of ticks within the state. If you are a Maryland resident and need a tick identified, please click on this link and follow the instructions. Around the home, reduce habitat for small mammals that serve as the blood meal for ticks and the source of disease causing bacteria. Remove piles of brush, unstacked wood, and rubbish that serve as a refuge for rodents and other small mammals. Mow and remove unkempt grasses, weeds, and other vegetation at the edge of the lawn. Mulch beds that border the transition zone between lawn and forest edge. By opening up these areas, raptors and other predators may more easily spot and remove small mammals. Design patios and play areas for children away from forest edges where ticks are more likely to be found. If you follow these precautions, you can greatly reduce the risk of encountering ticks and associated illnesses, while still enjoying the great outdoors.